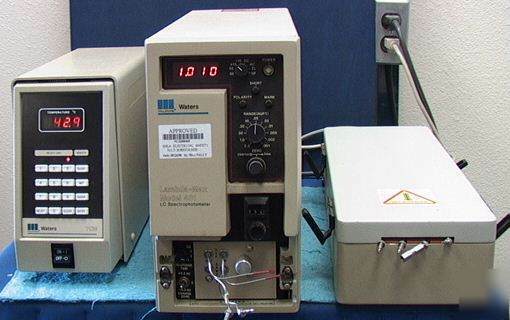 Millipore Waters Lambda-Max Model 481 LC Spectrophotometer 3-piece system with Variable Wavelength Detector. The TCM Temperature Control Module is on the left. It controls the the temperature of the chamber on the right. It has an IEEE-488 interface. We assume the tubes from the heated chamber would be connected to the analyzer in the center in actual operation. Might be just what you need for your liquid spectrophotometer anaylzer application.